Custom printed Pill Organizers offer larger compartments. Large compartment pill organizers offer a variety of compartments to easily dispense medications, vitamins or herbal supplements for different times of the day. 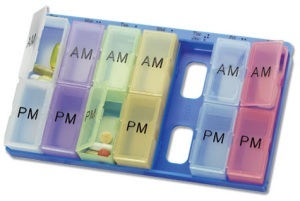 Pill organizers are available with AM/PM compartments, morning, noon and evening compartments and morning, noon, evening and bedtime compartments. 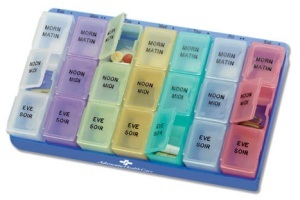 Separate compartments for AM and PM doses, 7-days a week. Set Up Charge: $50.00 new orders and, $25.00 on re-orders. 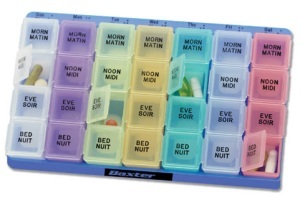 This super pill organizer has separate compartments for morning, noon and evening doses, 7-days a week. If a PMS Color match is requested add $50.00 per PMS color. Some PMS colors may not match exactly due to product color.